Have an analytical mind? Like to cook? This is the site to read! CoolCover Kitchen Knives Metrokane Mighty OJ (Not recommended) What's In Your Non-Stick? Chili's Bacon Burger Food Fete 2013 Lunar Eclipse Thermoworks DOT Thanksgiving 2014 Giveaway! Christmas Gift Ideas Food Fete 2014 Michael Ohene's Cookie Recipe Generator Thermoworks Father's Day 2014 Giveaway! Codlo Sous Vide Controller Kickstarter Food, Inc Orange Juice Shelf Life Thermoworks Thermapen 2013 Giveaway! Comments and Forums Foodoro Orthogonal Thought - A New Blog Thermoworks Thermapen 2014 Giveaway! Comments and Forums Back Online Free Cookbook from Snubbr Pixar's Ratatouille Thermoworks Thermapen and Oven Thermometer 2012 Giveaway! Donations Please! Inside the CIA Santa Cruz Clam Chowder Cook Off 2006 What's the Most Trans Fat You've Seen? 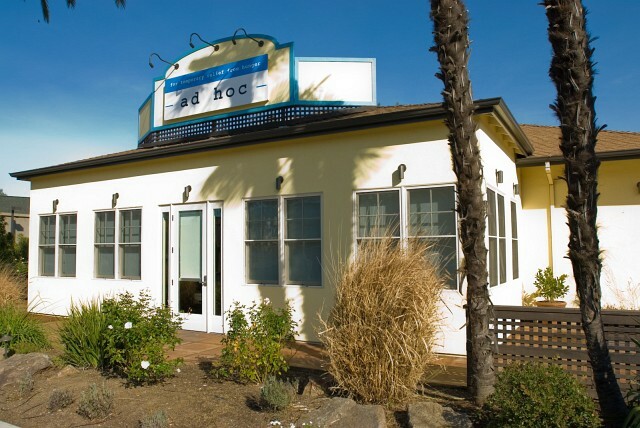 In September 2006, Thomas Keller, executive chef and owner of The French Laundry, Per Se, and Bouchon, opened a temporary restaurant in Yountville, CA called "Ad Hoc". At Ad Hoc, there is only one four-course menu for each night (everyone eats the same appetizers, entrees, and desserts), the menu is never the same, the food is based on home-style American comfort food, and the dinners are prix fixe. Oh, and the restaurant is supposed to close in a couple months, but no one really knows when. I thought "Homestyle American cooking by the only American-born chef to have two Michelin 3-star restaurants? I have to check it out." 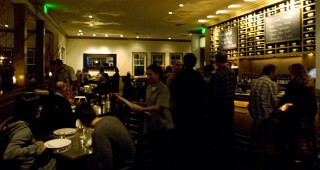 I had been hearing about Ad Hoc for a couple months before deciding to dine there. The story actually starts almost a year ago when I read an article in the newspaper about Thomas Keller's intentions on opening a new type of restaurant that served "common" food to foodies - a place where you could buy gourmet hamburgers while sipping the famed wines of Napa Valley. He would call the place "Burgers and Half Bottles" and purchased a restaurant at the south end of Yountville (the "unofficial culinary capital of Napa Valley" according to at least one piece of literature available at the Chamber of Commerce) called "Wine Garden". 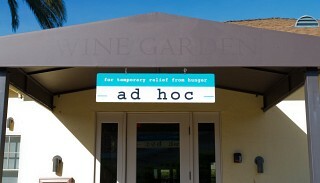 Months later, Burgers and Half Bottles still did not appear, but a new restaurant was announced: Ad Hoc. According to the internet buzz, Keller was taking his time figuring out how his burger joint was going to look and run and in the meantime was setting up an interim restaurant that never served the same food twice. Would the restaurant eventually be replaced by Burgers and Half Bottles? No one knows. Will the restaurant stay open? No one knows. All we know is that it will be open for another six months - maybe less, maybe more. The food at Ad Hoc is themed around Americana - foods that you would expect to be cooked in the stereotypical American home (beef brisket, roasted sirloin, pot roasts) - but raised to fine dining levels. The price you pay for your meal? Prix fixe $45. Reviews of Ad Hoc started pouring in after it opened - many good, some bad. Most of the food magazines and newspapers seemed to rate it favorably, while a surprising number of the internet reviews were not so positive. It seemed that some people were offended at being offered tri-tip or roast chicken and were disappointed in the overall meal. Was this a case of misplaced expectations? Were they expecting haute cuisine? Was this some sort of culinary Russian roulette (it seemed like if you got lucky and the evening's menu was outstanding and contained fresh produce from the French Laundry's gardens, just 1/2 mile up the road, then you'd be in for a treat)? I wanted to find out, but I want to find out a lot of stuff, so I didn't actually think I'd go up to Yountville to try out the food. 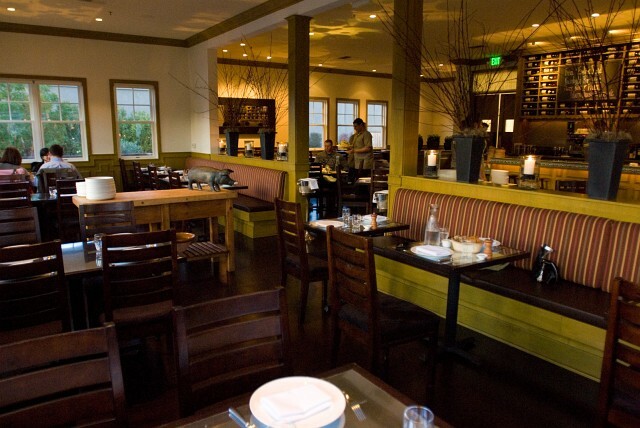 However, on Friday evening, while trying to find a suitably relaxing activity to fill our first free Saturday since a couple months before Thanksgiving, I suggested to Tina that we head up to Napa Valley to eat at Ad Hoc. Tina liked the idea, so off to Napa we would go. At some point - around midnight - it dawned on me that maybe I should have called the restaurant to see if they take reservations. I had read previously in several newspaper articles and dining websites that Ad Hoc had a walk-ins only business. They took no reservations (or only for larger parties). I checked again and that did seem like the case... at least that's what the internet told me. I should have called. Don't believe the lies. You need a reservation to get a table. The number is (707)944-2487. We drove the two hours to Yountville the next morning and hung out around town, sampling foods here and there to pass the time - just enjoying the slower pace of life and small town feel away from the Napa Valley Highway. At around 3pm, I called Ad Hoc to find out when they would open (no one in town seemed to know when they opened and it was not posted on their door) and was informed that they would open at 5pm, but they were completely reserved for the evening. Uh oh. I asked whether we could walk-in and was told that the bar had limited seating, but if I got there at 5pm, I could get seated at the bar. We wandered back to the restaurant to see if they had posted the evening's menu yet (when we arrived in town at noon, the previous night's menu featuring some preparation of flank steak was posted). They had. Unfortunately, it was going to be pork loin. As a general rule, we don't like pork loin. We never order it at a restaurant. There's just no way to do it right. Here's the problem: During the last couple decades, pork in the United States has been raised to be leaner and leaner to appeal to the low-fat culture. It's not just a marketing campaign; the "other white meat" really is the other white meat. It's colorless (well, actually it's grey as in bland, gloomy, and depressing), nearly flavorless (without any fat, it just tastes like cooked protein, which of course tastes like chicken), and is usually tough. Recently, companies like Swift have noted these problems with pork and now their major seller is a pre-marinated pork loin that is injected with a salt solution, tenderizers, and some coloring agent. The problem? The pork isn't as bland anymore, but it takes on an unnatural orangish pink color when cooked, is salty (which is a definite improvement), and now has a spongy texture. Tough or spongy - in my mind, both unappetizing choices. We stared at the menu and discussed whether we should try our luck at acquiring a seat when the evening's service began and roll the dice with this pork loin, or simply go eat somewhere else. We agreed that if pork loin could be redeemed for us, then this would be its chance. Could Thomas Keller and his handpicked executive chef(s) make a pork loin that we would feel justified to spend $45 for? So, we waited. At around 4:30, I noticed that the entire staff (or at least that's what it seemed like) was gathered in the front room of the restaurant in a giant circle - perhaps praying as a group or having a giant football huddle? (I deduced later that this was actually the time where they were sorting out their story and game plan, making sure everyone knew what was being served and how the food was prepared and what region every ingredient came from.) I didn't take a photograph because I already felt awkward that we were the only people hanging around outside of the restaurant. At 4:45, there was still no one else waiting, perhaps we hadn't needed to camp out for this, no one else was doing it. At 4:50 a young lady opened the door and smiled at us; we were in! As a bonus, she informed us that a cancellation had been phoned in, and we had a table! Our waiter was a well spoken, friendly man named Nessim. He chatted with us briefly and left us the menu (a courtesy since you didn't get to choose anything and the courses were prominently displayed on a chalkboard overlooking the dining room) and wine list. For the next five minutes, we were the only patrons in the restaurant. It's an interesting experience when you have a room full of extremely well trained wait staff and two diners. We were sitting at our brushed chrome, two-person table studiously examining the wine list while being keenly aware that every member of the wait staff was watching us. They were standing two by two in specific locations - this corner, that corner, precisely in the middle of that wall - and smiling at us. It reminded me of the scenes in Marie Antoinette where the King and Queen of France ate their meals in front of an audience with their servants standing at the ready. Nessim appeared miraculously and ended the interesting but awkward (and yet still friendly) moment and after some discussion we ended up ordering a glass of Cabernet Franc from a vineyard local to Napa Valley (which I inexplicably neglected to record the name of). The decor of the restaurant is minimalist with simple white walls and wood trim and center post tables with chrome surfaces. The lighting (as the sun went down) was a gentle yellow light - a pleasing, comfortable level of light, but not enough for my camera to pick up the true colors of our meal without auxiliary illumination or supports, neither of which I wanted to introduce into the restaurant. Our water (we ordered the local tap) was provided in a 1 liter carafe (self serve), and a pepper grinder and small dish of sea salt was available on each table. The music was popular contemporary and louder than we expected - not loud enough to make you feel you needed to raise your voice, but definitely not subtly in the background at the edge of hearing. It fit perfectly with the young, contemporary feeling of the restaurant and the short sleeved shirts and casual black pants that were the uniform of the staff. 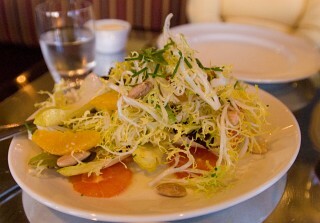 Our first course was a Frisée and (Belgian) Endive Salad. The salad, like all the food in our meal, was served in the middle of the table, family style. The frisée and endives were lightly tossed with a surprisingly salty lemon vinaigrette. I was thrown off at first, but the saltiness quickly melted away to reveal the subtle taste of the fresh vegetables. The salad also had sweet rounds of orange, blood orange, and grapefruit (the sweetest grapefruit I've ever had) and lightly toasted almonds. The combination of the almonds, citrus, and salty greens worked well together and definitely got our bodies eager to begin the main course our meal. We had earlier expressed concern over the pork loin to Nessim when he came back with our wine. He agreed that pork can often be tough and unflavorful, but they had used Kurobuta pork and had brined it for ten hours prior to roasting. Kurobuta pork is like the Kobe beef of the porcine world. Like the Wagyu breed of cattle that was refined by the Japanese, the Berkshire pig had undergone a similar refinement by the Japanese. 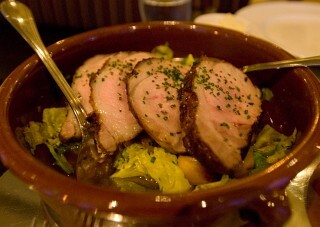 This Kurobuta pork would not suffer from the same low-fat, low-taste problems of standard American pork. (Our Kurobuta pork would be sourced by Snake River Farms, an Idaho-based family farm that has grown to be the largest producer of American Kobe beef, a sought after cross-breed of Wagyu with Angus.) Nessim assured us there would be at least 1/4-in. 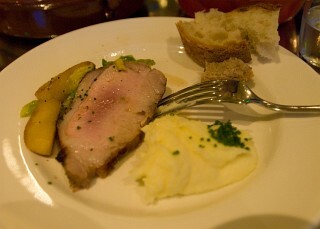 layer of pork fat along the rim of the loin as well as a full flavored and tender (because it was well marbled) muscle. Could it be true? When the pork arrived in an earthenware vessel, four slices, atop a bacon jus, wilted Savoy cabbage, and caramelized fuji apple slices, I was pleasantly surprised. The pork was cooked medium - the way I do it at home (and in direct defiance of the debilitating USDA standard of 160°F). After eating our pork, we were pretty much full and very happy. We were pleased that someone was able to prove to us that pork can still be good to eat. I was also particular taken with the preparation of the cabbage. Rarely had I had cabbage taste so good - perhaps it was a combination of the bacon jus and the sweetness of the Fuji apples that did it, but the next day, I bought Savoy cabbage to cook in my own kitchen. My mom will probably be happy to hear that I'm eating my vegetables. Our cheese course featured a local cheese made by Cowgirl Creamery called Pierce Point. The cheese starts with organic cow's milk and is "washed in a muscato wine and rolled in dried herbs from the Tomales Bay coastal region" (according to Cowgirl Creamery's website). 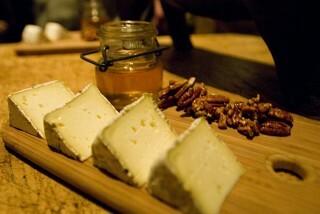 All this was lost on us as we ate the cheese with candied pecans and drizzled honey. The combination was almost intoxicating - and it wasn't until after we were done that I realized that I didn't take any pictures! A word with Nessim was all it took for him to enlist the help of his fellow staff members. A few minutes later, a tap on my shoulder revealed Nessim who brought me to a staging table where I photographed the next cheese course ready to go out to a table of four. I took the opportunity after our plates were cleared (for the third time, once after each course was completed) before dessert, a dark chocolate brownie served warm, to look around. 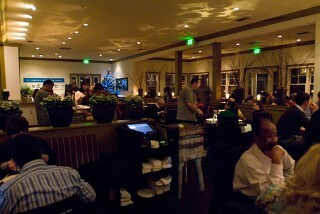 The table next to us on the left was just starting their salad; the table to the right finishing the cheese course. The table behind had the unmistakable sounds of the delight of pork loin. Up until now, I'd never eaten at a restaurant where there was only one menu for the evening, and there's a certain excitement that comes from seeing others about to partake in the same experience you just had moments before. 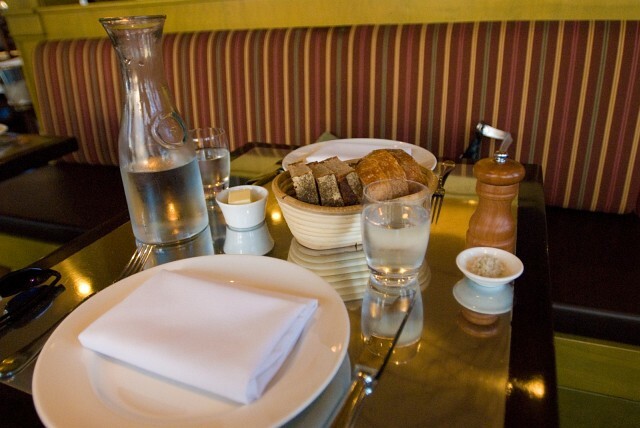 In many ways it's comforting, just like the comfort food that Ad Hoc serves. 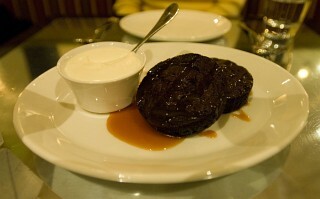 The brownies were served warm with caramel sauce and a vanilla whipped cream. It was quite good, but was overshadowed by the previous courses. It was nothing spectacular or earth shattering, but a pleasant way to end the meal. Because brownies are so dense, we shared one and had the other packed away for a dessert to be had at home. Our meal was now complete. Was the dining experience worth it? 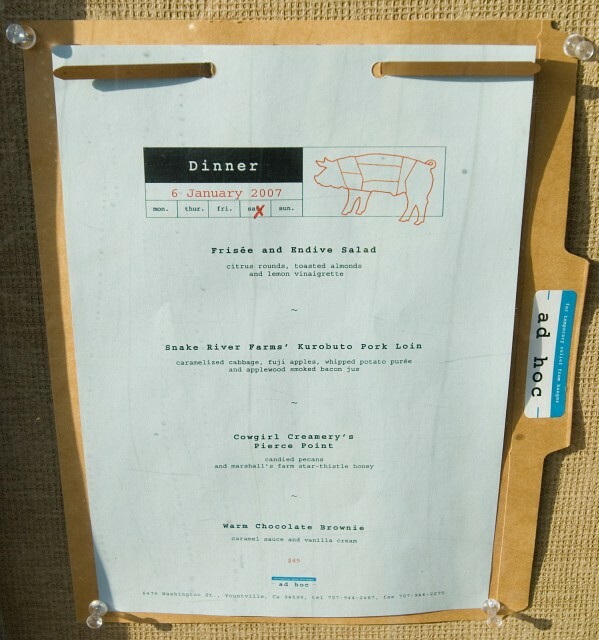 For us, for this particular menu, it definitely was. 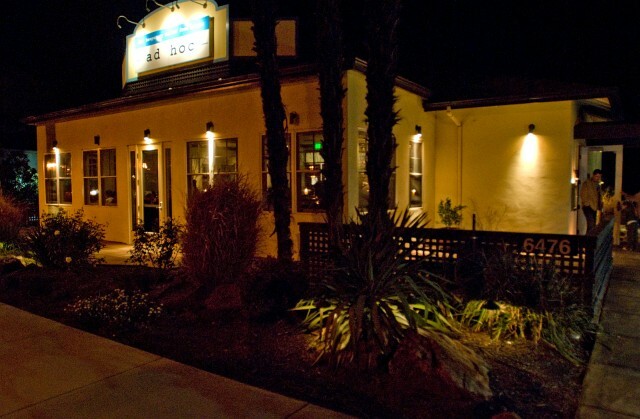 If we're heading up to Napa Valley and Ad Hoc is still around, we'll definitely eat there again, but next time we'll call ahead for reservations. The restaurant at night as viewed from Washington Street. The entrance is to the right, away from the light traffic. This meal sounded wonderful! If it is still there when I make a visit to Napa, I'll definitely check it out. great review! had me salivating over the description of pork loins. this is one of my favorite restaurants, and i've only been there ONCE! great writing! Wow! I haven't been to Ad Hoc but some of my family members just came from there a week ago and visited my cousin Dave Cruz...one of the Chef's at Ad Hoc. Just from reading your blog makes me want to get in the car and drive up there. You think I can easily make a reservation by being a first cousin of one of the Chef's? I hope so! Regards and Happy New Year! They have their own website now! Soon one can sign up to get the daily menu by email. hey michael, just fyi, their prix fixe menu is now $49.